Clove oil uses include support to healthy immune system and antioxidant support*. Traditional Chinese Medicine used clove for supporting a healthy digestive system. This oil includes the naturally occurring constituent eugenol. It may support overall wellness*. Today, it is still known for its healthy immune supporting properties* and is contained in Young Living's famous blend Thieves which contains cinnamon, clove, eucalyptus, lemon, and rosemary. Did you know that Clove also has the largest antioxidant value of any single ingredient tested? Right now it does! Longevity essential oil contains clove and other oils with high antioxidant values! So, with all of these clove oil uses, let's easily take advantage of the benefits every day using Clove Essential Oil! Just use a drop in your favorite recipe! There are so many more benefits listed below, so keep on reading! I designed this section so you could use it as a fun and easy reference guide. It will tell you how to use your oil, what to use it for and provide you with more clove oil uses. It will also provide you with some fun tips, testimonials and oil trivia! As I receive new tips and clove oil uses they will be added to the page, so check back often! Want to Purchase Therapeutic Clove Oil? Go to the Oil Shop! Buy Clove Essential Oil Here! What is the Genus And Species? Syzygium aromaticum (scientific name). From what I have researched, clove also has several synonyms (same name for same plant). These are Eugenia caryophyllata, Eugenia caryophyllus, Caryophyllus aromaticus, Eugenia aromatica and Myrtus caryophyllus. I have definitely seen Syzygium aromaticum, Eugenia caryophyllata and Eugenia caryophyllus used interchangeably and it does get confusing! If anyone finds any other information or finds this incorrect, please let me know! Why is this Information Important? Well as you can see it is confusing when different names are used for the same plant. Additionally, there are 400 to 500 species of clove including several chemotypes. So, it is a good habit of purchasing essential oils using the common name and the genus and species. What is the Origin of the Plant Name? Clove comes from a Latin word "clavus" meaning "nail". Did you know that Clove is contained in Hildegard’s Physica Book? Hildegard of Bingen (1098-1179) was known as the first herbalist and naturopath of the middle ages. Her book documented her work. What are the Plant Properties? Antioxidant. Energizing and revitalizing; and warming. What is the Aromatic Affect on the Mind? Its hot and spicy aroma brings clarity! What is the Spiritual Influence? Clove oil uses includes the spiritual realm as well. Clove is said to provide insight into our emotional discomfort. How many times have something has happened only to find out later there actually was a hidden meaning behind it? For me, all the time! But it was about eight years ago that I realized that every time I really just didn't want to go to work that day, I would manifest something that would self sabotage! We all have days like that, but that was how I learned to "take a day off". I wasn't honoring that I needed a day off and needed to just take it on my own! That taught me how to be nourishing to myself. So, clove can help us in this respect. It helps us reflect on the causes of our sabotage; and assists us in releasing them because they no longer serve us! 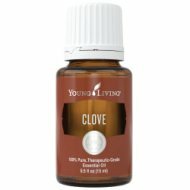 By the way, Clove is in PanAway Essential Oil Blend. What Chakra is Affected? Solar plexus, heart and throat chakra. What is the Corresponding Chakra Color? Deep Blue or Indigo. Interested in Dietary Clove Oil for Your Culinary Adventures? Then check out Clove Vitality Essential Oil! Can this oil be used for Animals? Yes, but honestly it is such a hot oil that I use it in professionally made blends, such as Thieves or Melrose Essential Oils. If you would like to use clove than a very high level of dilution is recommended for pets. Have your animals smell it directly from the bottle or place a drop or two in your palm, then smell. Or place a drop in your palm and pet head to tail to toe. Note about Animal Use: Certain oils can be very toxic to cats. Pine and citrus oils in particular that are not of therapeutic quality! Please consult your vet if you are not sure about applying any essential oil to your pet. Because it is approved as a Food Additive (FA) by the FDA, food grade clove oil is readily available on the market. Please remember, these are not the same oils and are often adulterated (changed). Clove is considered non-toxic at normal usage levels and is generally regarded as safe (GRAS). Can cause extreme skin irritation therefore dilution is recommended. Always dilute before applying to the skin. Check with your health care provider if taking a blood-thinning medication. Did you know that before the Dutch conquerors destroyed all the clove trees in the Spice Islands, the Penang people were very vibrant people. This happened in the sixteenth century. Did you know that Clove was one of the ingredients found in "Four Thieves Vinegar" or "Marseilles Vinegar"? Thieves used the formula when robbing graves in the 15th century. Diffuse to spice up the environment! Add orange and cinnamon!